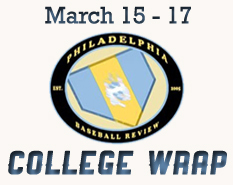 Villanova's Pat Young and La Salle's Shawn O'Neill each put together stellar pitching performances in a busy weekend on the Philadelphia college baseball scene. Weather forced some schedule modifications with the Big Five Baseball Bash, but all the local teams played doubleheaders on Sunday to make up for Saturday's missed action. Saint Joseph's vs. Marist: The Hawks surrendered three runs over the final three innings in a 6-4 loss to the Red Foxes. Kyle Mullen tossed 6 1/3 innings, surrendering five runs on six hits. Chris Hueth finished with three hits. La Salle vs. Wagner: Dan Klem collected four RBIs as the Explorers exploded for a five-run sixth to trump Wagner, 8-7. Pat Christensen tossed 2 1/3 scoreless innings in relief. Villanova vs. Chicago St.: Pat Young notched 18 strikeouts over seven innings, leading the Wildcats to an 8-2 win. Kevin Jewitt collected a pair of RBIs in the winning effort. Penn vs. George Washington - Gm. 1: Connor Cuff tossed six strong innings, surrendering one run on three hits to lead the Quakers to a 2-1 victory. Spencer Branigan and Ryan Deitrich each collected a pair of hits in the win. Penn vs. George Washington - Gm. 2: The Quakers received another excellent pitching performance, this time from Jeff McGarry who went eight innings in a 9-2 win. Michael Vilardo collected three hits while Brandon Engelhardt drove in three. La Salle vs. Chicago St. - Gm. 1: The Cougars scored four runs in the fifth to trump the Explorers, 6-1. Kevin Conroy finished the contest 3-for-4 with an RBI. Shane Hollman struck out seven over four innings in the loss. La Salle vs. Chicago St. - Gm. 2: Shawn O'Neill tossed a complete game one-hitter, striking out 10 as the Explorers beat the Cougars, 7-0. Kevin Barron finished with two RBIs. Penn vs. George Washington - Gm. 1: Pat Bet surrendered six runs but just one was earned over four innings as the Quakers fell, 6-4. Mitch Holtz tossed three scoreless innings in relief. Penn vs. George Washington - Gm. 2: Brandon Engelhardt finished 3-for-5 with three RBIs as the Quakers beat the Colonials, 6-4. Ryan Mincher and Gary Tesch each collected a pair of hits in the win. Temple vs. Penn State - Gm. 1: Patrick Peterson tossed five innings and surrendered just two runs as the Owls bested the Nittany Lions, 4-2. Henry Knabe finished 2-for-4 with a pair of RBIs while Preston Hill tossed four scoreless innings in relief to notch the save. Temple vs. Penn State - Gm. 2: Bobby Heitzman hit game-winning sacrifice-fly in the 10th to lift the Owls past the Nittany Lions, 3-2. Eric Peterson tossed seven strong innings, scattering three hits while surrendering two runs. Ryan Kuehn picked up the win tossing three scoreless innings in relief. Allen Stiles scored the winning run and finished with three hits. Saint Joseph's vs. Wagner - Gm. 1: Stefan Kancylarz finished 3-for-4 with four RBIs as the Hawks downed Wagner, 14-5. Collin Forgey added three hits in the winning effort as Daniel Thorpe tossed six scoreless innings in relief. Saint Joseph's vs. Wagner - Gm. 2: The Hawks used six pitchers en route to a 6-5 win over Wagner. James Harrity picked up the win despite allowing an unearned run in the ninth. Villanova vs. Marist - Gm. 1: Josh Harris tossed seven strong innings but Mairst broke through with a run in the seventh to take the contest, 1-0. Harris struck out seven and did not walk a batter. Villanova vs. Marist - Gm. 2: Luke Emling collected three hits, including the game-winner in the 10th to lead the Wildcats past the Red Foxes, 4-3. Matt Meurer tossed 2 1/3 scoreless innings in relief to pick up the win.